I’ve always been curious to try Stylearc patterns. 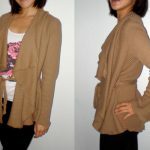 My favourite style of cardigan is a long, open front cardigan. 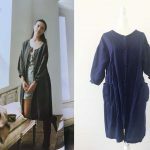 When I saw Stylearc’s Simone cardigan, with its drapey pockets and longer back, I had to give it a go! 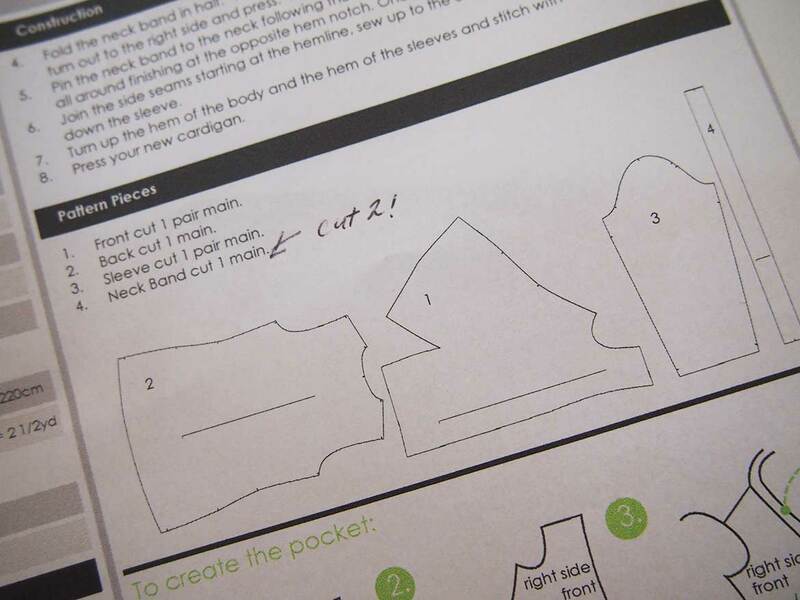 Pattern Errors + Tips – Read Before Sewing! 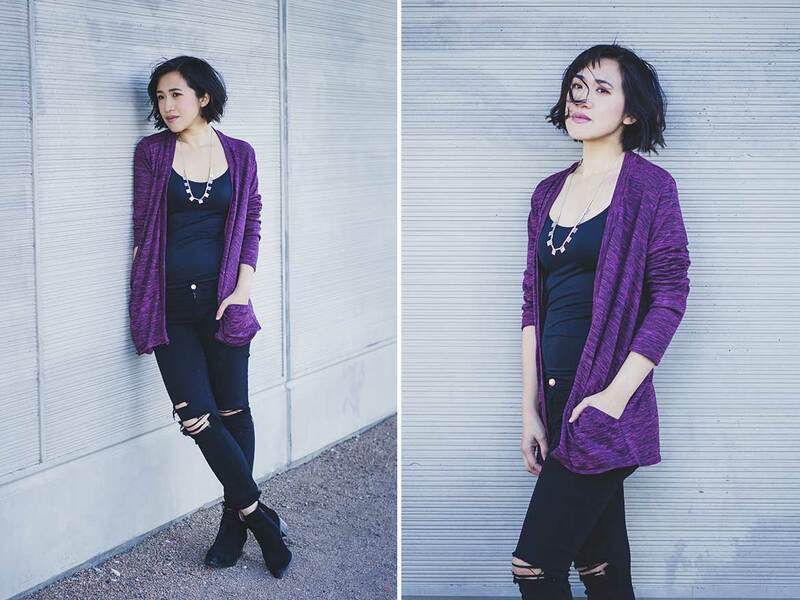 If you’ve been inspired to give the Simone cardigan a go, let me first share my experience with you. The cutting diagram says to cut one Neck Band – this is incorrect. You need to cut TWO and then join them at the centre back to create one long neck band. Baste EVERYTHING. Stylearc instructions call this a “stay stitch”. 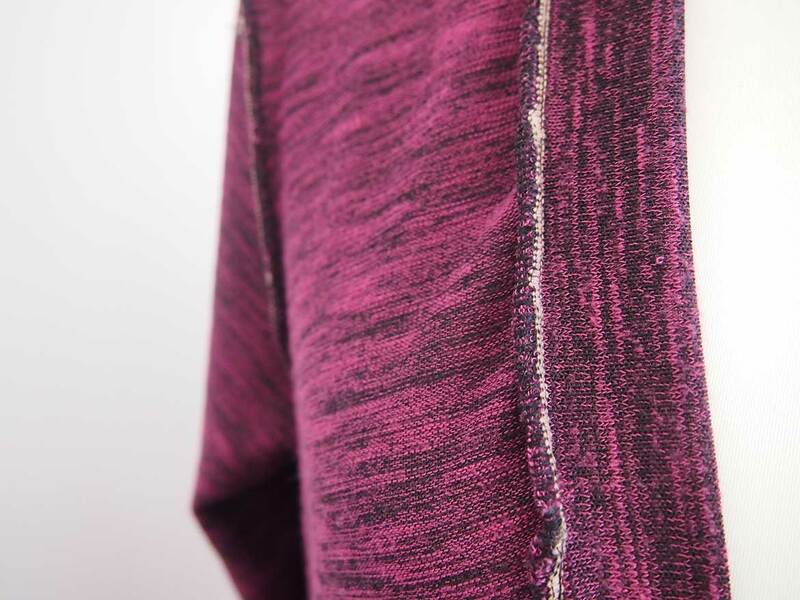 But basically, before you run your garment through the unforgiving knife of the serger, make sure you hand stitch the seams first. I didn’t bother making the neck band before attaching it to the body. The instructions says to fold the neck band lengthways with the wrong sides outwards, stitch, and turn to right side. I simply folded the the neck band with the right sides outwards, basted on to the body and then used the serger to stitch everything together in one go. Don’t forget to use woolly nylon thread (you can see my ecru coloured woolly nylon in the inside pics). You only need to use it in the upper looper. I decided to hem the body BEFORE attaching the neck band. This is totally up to you. 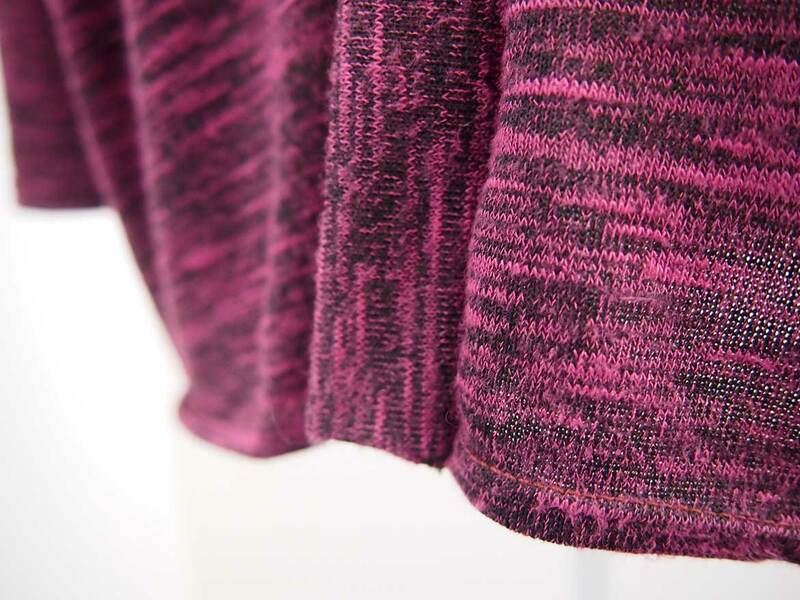 For me, the neck band felt too bulky to stitch neatly alongside the hem. Oh, and I used a twin needle to stitch the hem for both the body and sleeves. Now that Umi is walking (she started at 9 months! ), I’m wearing more jeans and leggings than ever, just so I can chase after her. 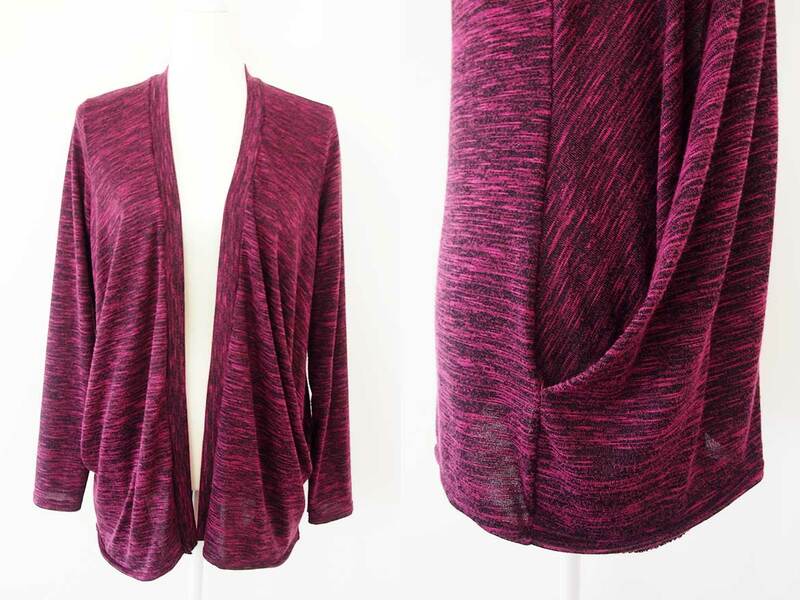 I really like how this open front cardigan is easy to throw on, and the length just covers my bum. Very important for those days when you just want to wear yoga leggings as pants! 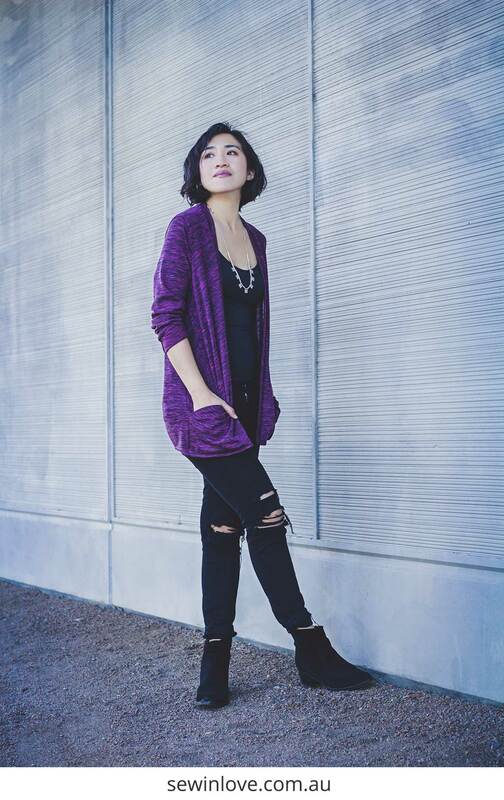 Once the weather warms up a bit, I think I’ll be wearing my cardi with denim cut off shorts or maybe my reversible dress for dressier occasions. In these pics I’m wearing a Uniqlo tank top, Nobody jeans (my fave Aussie denim brand), Dolce Vita ankle boots and a Madewell necklace. 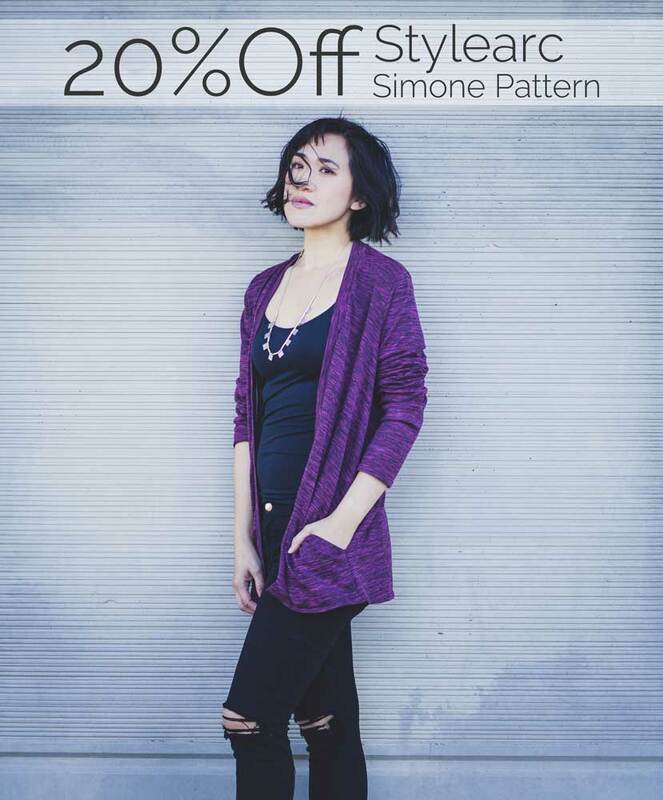 The folks at Stylearc are kindly offering 20% off digital downloads of the Simone cardigan sewing pattern. Normally $15 AUD, you can get it for just $11.82 right here. It comes in Australian size 4 to 30 (US 0 to 26). 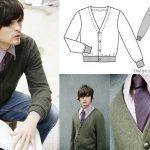 Thank you Stylearc for providing this sewing pattern for me to review. Model photography by Sushil Sidhardhan. Product photography by Rin.